Home » News » Uncategorized » Introducing The Skinny! Do you have landing lights already installed in your wingtips? Don’t want to move them? The Skinny will help you meet your strobe and position lighting requirements. Used in place of the normal Flyleds forward-facing board, The Skinny is only one inch wide, as shown at the right of the picture. With the connections and resistors tucked away inside the wing, it leaves plenty of room for your lights. 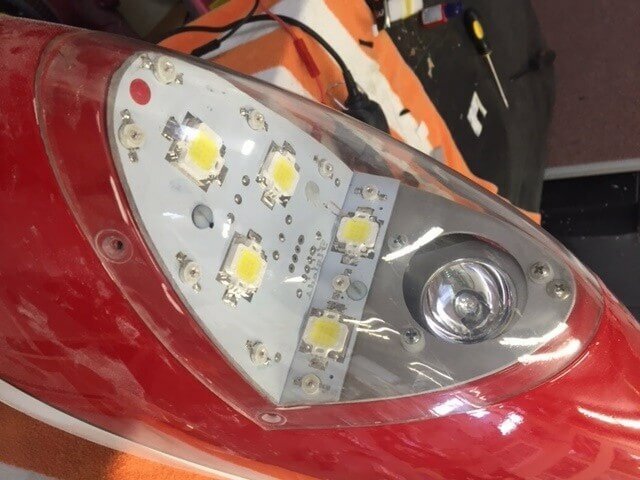 Supplied as the left and right PCBs only, as an optional upgrade to a Flyleds lighting kit. The components are supplied in the appropriate wing kit. Check our Products page for more information. ← RV-4/-6/-8 kits are here!